Obviously by reading my blog you get to read about different models, celebs and people associated in their worlds. But I always want my readers to get to know new models on the rise or who are still rising. This post is about a model who you mostlikeley have heard of, if not, keep reading! Jourdan Dunn is a remarkable young lady who has achieved so much in her 6 years of modeling. But also having to deal with big problems in the modeling world such as diversity problems. She was the first black model to walk for Prada in over a decade, before that, Naomi Campbell had the ''honors''. Jourdan attracted lots of attention, for walking the show and due to the lack of black models in the modelling industry. Jourdan was discovered whilst having fun with her friend in the sunglasses section of the Hammersmith Primark in 2006. A woman from Storm Model Management approached her and asked if she has ever thought about modelling. She was signed with Storm Model Management short after the approach. After being signed she made her runway debut was in the Fall of 2007 when she walked show for Marc Jacobs and Polo Ralph Lauren. The same year she was featured on British Vogue as a ''New Star''. Within a year she'd walked shows on the catwalks of London, Paris, Milan and New York. And got major recognition in 2008 for being the first black model to walk the Prada runway in over a decade. Style.com listed her as one of the top 10 newcomers. She has now done campaigns for Burberry, River Island, Yves Saint Laurent, Calvin Klein, Rag and Bone and more. She has covered the Teen, Italian, British and American editions of Vogue, the French Elle etc. Since her debut on the runway Jourdan has walked numerous shows for big names such as, Jean-Paul Gaultier, Oscar De La Renta, Versace, Valentino and Michael Kors. But still many people don´t know that Jourdan has a little son! I get that, they all think when did this Brit Beaut manage to fit bringing a child on earth in her extremely busy career?! Her now three-year-old son, Riley, who is suffering of Sickle-cell disease, was born on the 8th of December, 2009. Besides being the gorgeous successful model and mommy Jourdan is, she also has her own little cooking program in Jay-Z's Life and Time Youtube channel. And is like one of her model friends, Sessilee Lopez what we like to call, a model-chef. While Sessilee runs a blog with great recipes, Jourdan is showing off her cooking skills in Jay Z's Life and Times - Well Dunn with Jourdan Dunn. The cookingshow became so succesfull that she's doing another season! In this season her model friends, Cara D and Karlie K are also popping in. As we all know there is a problem with diversity in the fashion industry. And probably every colored model has encountered some form of racism in their career. Jourdan talked about her encounter during her interview at the Jonathan Ross show. She explained how a make-up artist didn't want to do her make-up, because she's black. Which doesn't make sense at all! And she's completely right! If you can't do any type of hair/skin what are you doing working as a hair/ make-up artist at fashionshows with diverse (wo)men?! The incredible thing about all this, is that Jourdan Dunn has achieved so much at the age of 22! And then she raises a son in the meantime. Astonishing! That makes her a great role model and inspiration for me and I also hope for the readers. There aren't many 22 year old mothers working in the industry, young and doing so much. Of course, some of you might think that because of her job she can´t be there for her son. ''I'm a mother first then a model, and generally the industry is really supportive. This is good career for a working mother.'' she explains in the Sunday Times Styles. See some highlights of her carreer below. 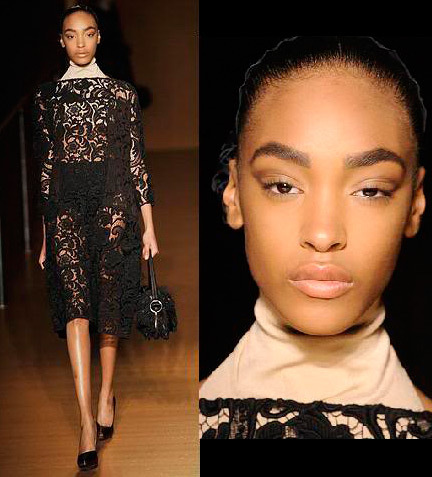 Jourdan, the first black woman ever walking the Prada Runway in over a decade in 2008! A few months later, in July she was featured on of the four Vogue Italia's 'Black Issue' covers, Liya Kebede, Sessilee Lopez and Naomi Campbell were on the other covers. And also in the editorial 'Modern Luxe' alongside Liya Kebede, Arlenis Sosa, Iman and many more! The same year she won the prize for 'Model of the Year' at the British Fashion Awards 2008! JD walking pregnant for Jean-Paul Gaultier during the Paris Womenswear Fashion Week S/S '10 on the 3th of October, 2009. Jourdan's beautiful son Riley was born on the 8th of December, 2009. Jourdan walked at the Closing Ceremony of the Olympics in 2012 with fellow supermodels Lily Cole, Stella Tennant, Karen Elson, Kate Moss, Lily Donaldson, Naomi Campbell and Georgia May Jagger! They were strutting down showcasing British designs such as Victoria Beckham, Vivienne Westwood, Alexander McQueen and more.